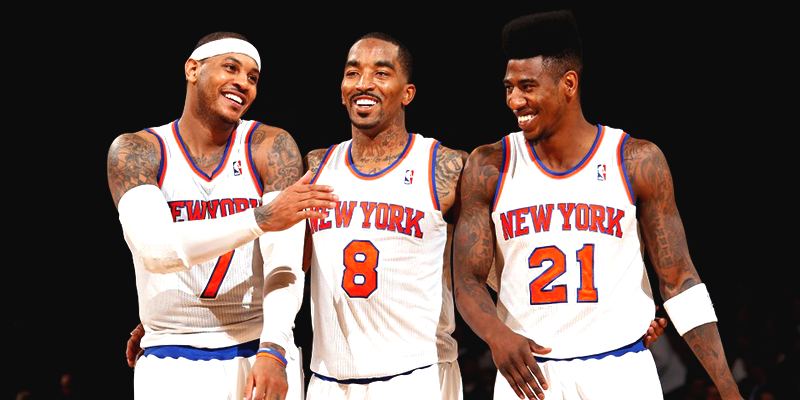 New York Knicks NBA Champions 2013-14? Yes, I said it. The New York Knicks will win the NBA Finals in 2013-2014 for a few simple reasons. While, it will not be easy for them as challenges and setbacks arise, I truly believe that at the end of the day, they are the best team in the NBA this year. Not only do the Knicks have a strong starting lineup full of big shooters, but they also have a core of rebounders, and defensive players that will trouble strong offenses. If we look at the squad from last year, Iman Shumpert, who was my pick for most improved player this year, wasn’t even healthy until the middle of the season. Shumpert is not only an explosive threat, but gives the Knicks the defense they’ve always lacked at the guard position. Additionally, with the acquisition of Andrea Bargnani, the Knicks will have help inside the paint on defense, and on offense. He also poses a threat from outside the paint and shot .399 last season. Last year, they had Ronnie Brewer who gave little to no production while part of the team, and Jason Kidd who had some good moments, but his age and shape factored into why he is now an NBA coach. Overall, the Knicks were definitely a success last year. They came in second place in the conference, a large improvement from past years, but fell short to Indiana missing the conference finals. They had depth, but through no names like Chris Copeland, and players on the verge of retiring from the game, such as Jason Kidd, Rasheed Wallace, Kurt Thomas, and Marcus Camby. Now, I am not saying these players didn’t help. Copeland proved to be a huge offensive aid for the Knicks, and the rest helped mentor the younger players through their years of experience in the league. Although, I believe most people would be more comfortable with Kenyon Martin, and Stoudemire rather than Kurt Thomas and Marcus Camby coming off the bench to grab boards. Yes, Amar’e is always an injury threat, but last year he barely even played and the Knicks played well without him. If the Knicks get a little more Stoudemire than last year, which shouldn’t be difficult, they will see improvements in both their pick and roll game and post defense. Are you convinced yet? I haven’t even mentioned Carmelo Anthony, and J.R Smith, their two biggest shooters. Anthony, and Smith both achieved their goals last year. Anthony won his scoring title, and JR received the NBA’s sixth man of the year award. If Carmelo, and J.R continue to take 30 shots a game, and are comfortable with hitting only two out of every five shots, the Knicks will not excel in the playoffs or during the regular season. These huge offensive weapons will need to find a way to hold back on some of their normal shots, and find the open man. Last year, it was tough because the Knicks didn’t really have anyone who could make their own shot besides Anthony and Smith. Now with Bargnani, Shumpert, and Metta World Peace, more passing options will be available. Carmelo Anthony averaging 25 points, 5 assists, 5 rebounds and shooting 50 percent from the field per game seems possible, especially with the team surrounding him. This is Carmelo’s team, and he will always get to take the big shots he wants, but the Knicks will only win the finals if he keeps his head up, and notices the open man in the paint when being double-teamed. To sum it up, the Knicks are faster, bigger, and younger than they were last year. With the old timers departing, some new key players joining the organization, and the health of the team improving, the Knicks will be unstoppable this year. Not only do they have one of the best offenses in the league, but now their defense will improve as well. Then, of course there are what ifs. What if Tim Hardaway Jr. has a break out rookie season? What if Amar’e stays healthy and goes back the 20 point 10 rebound guy he use to be? What if the Knicks find talent in a player like Chris Smith that they didn’t even know was possible? The possibilities for the Knicks are endless. This team is very underrated this year, and if it’s ever time for them to bring a championship back to New York it’s NOW!